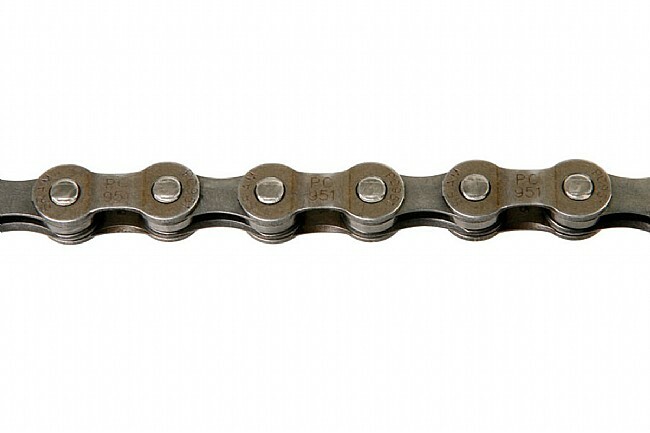 The PC-951 is a basic yet great performing chain for 9-speed drivetrains. Step™ Riveting process for incredible pin strength. Powerlink tool-free connector included. Grey. Width: 6.8mm. Links: 114. Weight: 294 grams. This is a reliable chain. I use it on a mountain bike that i use to commute through midwestern winters and rain in the summer time. Works as well as any other chain I have used. Easy to install, easy to remove when cleaning is needed and reinstall. Recommended. Quality chain at reasonable price. Takes over two of these for my Carbent carbon recumbent hi-racer bike (almost 250 links). I've used this chain product for many years and always seek it out when replacing my recumbent chain. It's not as shiny as the more expensive but seems to be quite serviceable and long-lasting.